John the Evangelist (Greek: Ἰωάννης, translit. Iōánnēs, Coptic: ⲓⲱⲁⲛⲛⲏⲥ or ⲓⲱ̅ⲁ) is the name traditionally given to the author of the Gospel of John. Christians have traditionally identified him with John the Apostle, John of Patmos, or John the Presbyter, although this has been disputed by modern scholars. Christian tradition says that John the Evangelist was John the Apostle. The Apostle John was a historical figure, one of the "pillars" of the Jerusalem church after Jesus' death. He was one of the original twelve apostles and is thought to be the only one to have lived into old age and not be killed for his faith. It is believed that he was exiled (around 95 AD) to the Aegean island of Patmos, where he wrote the Book of Revelation. However, some attribute the authorship of Revelation to another man, called John of Patmos or to John the Presbyter. Orthodox Roman Catholic scholarship, most Protestant churches, and the entire Eastern Orthodox Church attribute all of the Johannine literature to the same individual, the "Holy Apostle and Evangelist, John the Theologian", whom it identifies with the "Beloved Disciple" in the Gospel of John. The authorship of the Johannine works has been debated by scholars since at least the 2nd century AD. The main debate centers on who authored the writings, and which of the writings, if any, can be ascribed to a common author. Orthodox tradition attributes all the books to John the Apostle. In the 6th century, the Decretum Gelasianum argued that Second and Third John have a separate author known as "John, a priest" (see John the Presbyter). Historical criticssometimes reject the view that John the Apostle authored any of these works. Most modern scholars believe that the apostle John wrote none of these works, although some, such as J.A.T. Robinson, F. F. Bruce, Leon Morris, and Martin Hengel, hold the apostle to be behind at least some, in particular the gospel. There may have been a single author for the gospel and the three epistles. Some scholars conclude the author of the epistles was different from that of the gospel, although all four works originated from the same community. The gospel and epistles traditionally and plausibly came from Ephesus, c. 90–110, although some scholars argue for an origin in Syria. In the case of Revelation, most modern scholars agree that it was written by a separate author, John of Patmos, c. 95 with some parts possibly dating to Nero's reign in the early 60s. The feast day of Saint John in the Catholic Church, which calls him "Saint John, Apostle and Evangelist", and in the Anglican Communion and Lutheran Calendars, which call him "John, Apostle and Evangelist", is on 27 December, the third day of Christmastide. In the Tridentine Calendar he was commemorated also on each of the following days up to and including 3 January, the Octave of the 27 December feast. This Octave was abolished by Pope Pius XII in 1955. The traditional liturgical color is white. John is traditionally depicted in one of two distinct ways: either as an aged man with a white or gray beard, or alternatively as a beardless youth. The first way of depicting him was more common in Byzantine art, where it was possibly influenced by antique depictions of Socrates; the second was more common in the art of Medieval Western Europe and can be dated back as far as 4th century Rome. In medieval works of painting, sculpture and literature, Saint John is often presented in an androgynous or femininized manner. Historians have related such portrayals to the circumstances of the believers for whom they were intended. For instance, John's feminine features are argued to have helped to make him more relatable to women. Likewise, Sarah McNamer argues that because of John's androgynous status, he could function as an 'image of a third or mixed gender' and 'a crucial figure with whom to identify' for male believers who sought to cultivate an attitude of affective piety, a highly emotional style of devotion that, in late-medieval culture, was thought to be poorly compatible with masculinity. Legends from the Acts of John contributed much to medieval iconography; it is the source of the idea that John became an apostle at a young age. One of John's familiar attributes is the chalice, often with a snake emerging from it. According to one legend from the Acts of John, John was challenged to drink a cup of poison to demonstrate the power of his faith, and thanks to God's aid the poison was rendered harmless. The chalice can also be interpreted with reference to the Last Supper, or to the words of Christ to John and James: "My chalice indeed you shall drink" (Matthew 20:23). According to the 1910 Catholic Encyclopedia, some authorities believe that this symbol was not adopted until the 13th century. There was also a legend that John was at some stage boiled in oil and miraculously preserved. Another common attribute is a book or a scroll, in reference to his writings. 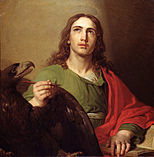 John the Evangelist is symbolically represented by an eagle, one of the creatures envisioned by Ezekiel (1:10) and in the Book of Revelation (4:7). ^ a b Ehrman, Bart D. (2004). The New Testament: A Historical Introduction to the Early Christian Writings. New York: Oxford. p. 468. ISBN 0-19-515462-2. ^ Theissen, Gerd and Annette Merz. The historical Jesus: a comprehensive guide. Fortress Press. 1998. translated from German (1996 edition). Chapter 2. Christian sources about Jesus. ^ Since the 18th century, the Decretum Gelasianum has been associated with the Council of Rome (382), although historians dispute the connection. ^ Kelly, Joseph F. (1 October 2012). History and Heresy: How Historical Forces Can Create Doctrinal Conflicts. Liturgical Press. p. 115. ISBN 978-0-8146-5999-1. ^ Morris, Leon (1995) The Gospel According to John Volume 4 of The new international commentary on the New Testament, Wm. B. Eerdmans Publishing, ISBN 978-0-8028-2504-9, pp. 4–5, 24, 35–7. "Continental scholars have ... abandoned the idea that this gospel was written by the apostle John, whereas in Great Britain and America scholarship has been much more open to the idea." Abandonment is due to changing opinion rather "than to any new evidence." "Werner, Colson, and I have been joined, among others, by I. Howard Marshall and J.A.T. Robinson in seeing the evidence as pointing to John the son of Zebedee as the author of this Gospel." The view that John's history is substandard "is becoming increasingly hard to sustain. Many recent writers have shown that there is good reason for regarding this or that story in John as authentic. ... It is difficult to ... regard John as having little concern for history. The fact is John is concerned with historical information. ... John apparently records this kind of information because he believes it to be accurate. ... He has some reliable information and has recorded it carefully. ... The evidence is that where he can be tested John proves to be remarkably accurate." Bruce 1981 pp. 52–4, 58. "The evidence ... favor[s] the apostolicity of the gospel. ... John knew the other gospels and ... supplements them. ... The synoptic narrative becomes more intelligible if we follow John." John's style is different so Jesus' "abiding truth might be presented to men and women who were quite unfamiliar with the original setting. ... He does not yield to any temptation to restate Christianity. ... It is the story of events that happened in history. ... John does not divorce the story from its Palestinian context." Dodd p. 444. "Revelation is distinctly, and nowhere more clearly than in the Fourth Gospel, a historical revelation. It follows that it is important for the evangelist that what he narrates happened." Temple, William. "Readings in St. John's Gospel". MacMillan and Co, 1952. "The synoptists give us something more like the perfect photograph; St. John gives us the more perfect portrait". Edwards, R. A. "The Gospel According to St. John" 1954, p 9. One reason he accepts John's authorship is because "the alternative solutions seem far too complicated to be possible in a world where living men met and talked". Hunter, A. M. "Interpreting the New Testament" P 86. "After all the conjectures have been heard, the likeliest view is that which identifies the Beloved Disciple with the Apostle John. ^ Dr. Craig Blomberg, cited in Lee Strobel The Case for Christ, 1998, Chapter 2. Cf. Marsh, "John seems to have believed that theology was not something which could be used to read a meaning into events but rather something that was to be discovered in them. His story is what it is because his theology is what it is; but his theology is what it is because the story happened so" (p 580–581). ^ Brown, Raymond E. (1997). Introduction to the New Testament. New York: Anchor Bible. p. 334. ISBN 0-385-24767-2. James Hall, Dictionary of Subjects and Symbols in Art, (New York: Harper & Row, 1979), 129, 174-75. Carolyn S. Jerousek, "Christ and St. John the Evangelist as a Model of Medieval Mysticism," Cleveland Studies in the History of Art, Vol. 6 (2001), 16. ^ a b c "Saint John the Apostle". Encyclopædia Britannica Online. Chicago, Illinois: Encyclopædia Britannica, Inc. Retrieved 2017-08-04. ^ Jadranka Prolović, "Socrates and St. John the Apostle: the interchangеable similarity of their portraits" Zograf, vol. 35 (2011), 9: "It is difficult to locate when and where this iconography of John originated and what the prototype was, yet it is clearly visible that this iconography of John contains all of the main characteristics of well-known antique images of Socrates. This fact leads to the conclusion that Byzantine artists used depictions of Socrates as a model for the portrait of John." Jeffrey F. Hamburger, St. John the Divine: The Deified Evangelist in Medieval Art and Theology. (Berkeley: University of California Press, 2002), xxi-xxii; ibidem, 159-160. Annette Volfing, John the Evangelist and Medieval Writing: Imitating the Inimitable. (Oxford: Oxford University Press, 2001), 139. Jeffrey F. Hamburger, St. John the Divine: The Deified Evangelist in Medieval Art and Theology. (Berkeley: University of California Press, 2002), xxi-xxii. Carolyn S. Jerousek, "Christ and St. John the Evangelist as a Model of Medieval Mysticism" Cleveland Studies in the History of Art, Vol. 6 (2001), 20. Sarah McNamer, Affective Meditation and the Invention of Medieval Compassion, (Philadelphia: University of Pennsylvania Press, 2010), 142-148. ^ Sarah McNamer, Affective Meditation and the Invention of Medieval Compassion, (Philadelphia: University of Pennsylvania Press, 2010), 142. ^ Sarah McNamer, Affective Meditation and the Invention of Medieval Compassion, (Philadelphia: University of Pennsylvania Press, 2010), 145. ^ Sarah McNamer, Affective Meditation and the Invention of Medieval Compassion, (Philadelphia: University of Pennsylvania Press, 2010), 142-148. ^ J.K. Elliot (ed. ), A Collection of Apocryphal Christian Literature in an English Translation Based on M.R. James (New York: Oxford University Press, 1993/2005), 343-345. ^ J K Elliott, "Graphic Versions: Did non-biblical stories about Jesus and the saints originate more in art than text? ", Times Literary Supplement, 14 December 2018, pp. 15-16, referring to the El Greco painting. ^ a b c Fonck, L. (1910). St. John the Evangelist. In The Catholic Encyclopedia (New York: Robert Appleton Company). Retrieved 2017-08-14 from New Advent. ^ J K Elliott, "Graphic Versions: Did non-biblical stories about Jesus and the saints originate more in art than text? ", Times Literary Supplement, 14 December 2018, pp. 15-16, referring to a thirteenth-century manuscript in Cambridge known as the Trinity College Apocalypse. 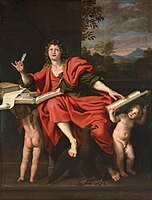 Wikimedia Commons has media related to Saint John the Evangelist. Wikisource has the text of the 1879 American Cyclopædia article John the Evangelist. 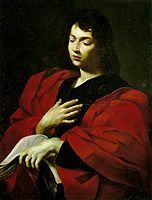 "Saint John the Apostle." Encyclopædia Britannica Online.